Prime Units with Lush Garden Views Available!! Turnover Date – Tower 1: October 31, 2017 | Tower 2: November 30, 2018 | Tower 3: May 31, 2019 Florence Mckinley Hill is situated inside Fort Bonifacio which is a 50 hectares owned by Megaworld. Mckinley Hill is Said to be the Biggest and Grandest Development in Metro manila as of Today. what’s nice about Mckinley Hill this whole 50 hectare is a Master Planned Community in which everything you may need is within your reach like Schools, Leisure Parks and Recreational, BPO Offices , Residential Tower and Even Medical Centers is just a Few stroll Away. The latest exclusive project at mckinley hill “THE FLORENCE ” is strategically located inside the township development in mckinley hill and will set to rise the standard of urban living with it’s ultra modern fascade and full glass windown this is the crown jewel property in Mckinley Hill. 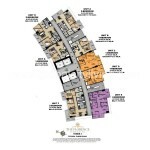 The Florence is located in the Heart of Mckinley Hill which is very accessible in 2 major doads which are C5 road and Lawtown Road, you are conneted with the major CBD which are Global City, Makati , Ortigas/libis and Pasig CBD with just a few stroll away from you place. The best thing about Florence is the PRIVACY that one can have in the residential development. It’s the only garden GATED development, wherein only residents can go in and out the development. It is near the Chinese International School, Korean International School, Enderun Colleges, Mint College, Embassies, Banks, Corporate Offices and International Companies. 3 BEDROOM UNIT — 94.7sqm — As low as P35,000 per month!